The Red Dawn remake has been remade to feature North Korean invaders instead of Chinese. 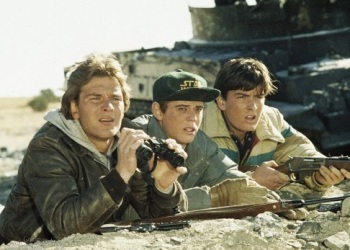 The original Red Dawn is a pure 80s classic: high school students Patrick Swayze, C. Thomas Howell, Charlie Sheen, Lea Thompson and Jennifer Grey band together to fight off Soviet invaders and make their way to "Free America." Wolverines! And in fine Hollywood fashion, somebody decided a couple years ago that it was prime material for a remake, except that this time around, because the Soviets are now the Russians and the Russians are our "friends," the invaders would be Chinese. The movie was actually made in 2009 but never saw the light of day because MGM, after coming out of bankruptcy late that year, decided against releasing it and other studios wouldn't go near it out of fear of offending China, which has become a big market for Hollywood fodder. And so it sat, collecting dust, until some smart fellow came up with the simple but brilliant idea of digitally editing all the Chinese invaders to make them North Koreans instead! Nobody likes North Korea, after all, and American films are forbidden in the isolated nation, which means that movie makers can say whatever they want about the country with no fear of repercussions, at least until North Korea actually does invade. The Hermit Kingdom also played the heavy in the seriously Red Dawn-esque THQ shooter Homefront, which was scripted by John Milius, the guy who wrote and directed the original Red Dawn. The new Red Dawn stars Chris Hemsworth, aka Thor, Adrianne Palicki, Josh Hutcherson, Josh Peck, Isabel Lucas, Jeffrey Dean Morgan and Connor Cruise, and is now expected to be out sometime in 2012.